This Fate Stay Night Tohsaka Figure is just great! I have been looking for a Fate Stay Night Tohsaka figure and this one fits the bill perfectly. Good Smile Company created this figure. They are known for great figures. It is 1/7 scale, so it’s a little bigger than most figures that I have seen. They are usually 1/8 scale. My favorite part of this figure is the crazy awesome hair. Fate/Stay Night is an awesome show! I have only seen one part of the Fate series, Fate/Stay Night. If you aren’t familiar with the show, it has to do with magicians going to war summoning different heroes from history. There are a few different shows and many games as well. If you are interested, check out the show right here. It’s one of my favorites. 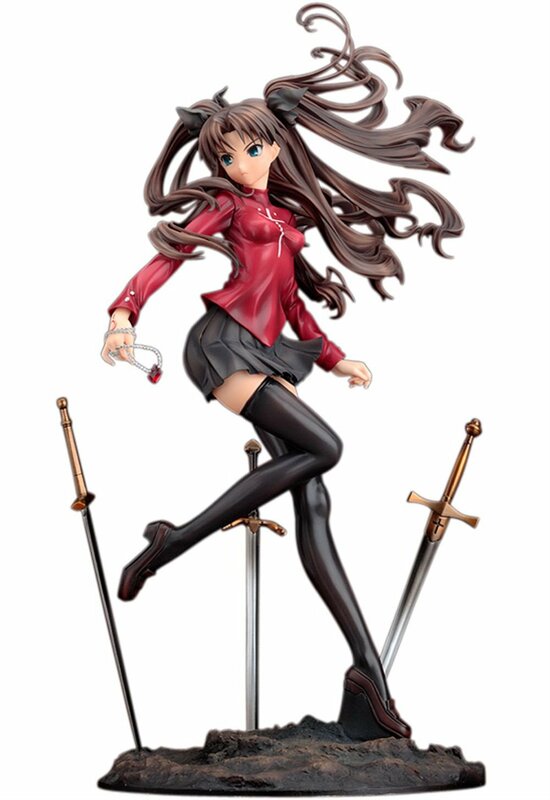 What does this Fate Stay Night Tohsaka figure come with? Unlike other Rin Tohsaka figures, this one includes a base with removable swords, hand replacements, one with a pendant and the other a dagger, and the figure herself. You can place the swords into the base that is shaped like the unlimited blade works world, it’s really neat. It’s just a mound of dirt but, it gives the illusion that she is part of a larger scene. Her hair it has a lot of motion to it and plays off nicely against her pose. It’s not a boring static figure because it has a great flow to it. You can customize her a little bit by changing out her hands. My favorite configuration is the one where she is holding her pendant. You can also switch to her hand holding a dagger. How did Good Smile do with this figure? Overall she looks great just like from the anime. The character design is not quite as detailed as in other figures however, they did a great job in making this character come to life. The artists at Good Smile company did a wonderful job with this Fate Stay Night Unlimited Blade Works figure. It’s a great sculpt and paint job demonstrates that point very well. I don’t really have any dislikes for this figure. Although there are a few other Fate Stay Night Rin figures. This one is of the best quality for sure.